Hi My name is Tor. I run a unique childminding setting called home from home and that is exactly what it is. It has all the comforts of a home environment with learning and opportunities of a nursery. I am hands on, who loves to encourage children to grow, develop and experience life at their own pace in a warm, safe and nurturing environment. Home from home runs using the Montessori philosophy, learning to do things for themselves like putting on their coats. choosing what they would like to do to encourage independence and self esteem.I believe in helping and encouraging children to develop these vital skills including both gross and fine motor skills so all their need to worry about when they start school is to make friends!!! At Home from home my ratios are low so i am able to give individual and close attention to each and every child and can cater to their own individual needs. Safety, care and happiness of children is paramount and I offer many opportunities and activities as well as having the flexibility of home care. I take children to the library, soft play, parks, museums, and other cultural interests (with prior permission) to experience all areas of life and things that interest them. I also have reasonable sized enclosed garden, which the children can grow their own plants and vegetables, read books, draw pictures, sand and water play, messy activities, roll in a ball pool, as well as many other resources and equipment which could be used inside or out. I also have access to 3 parks in close proximity. I have worked with children for the past 15 years in a variety of settings and for various ages from 6 months to 15 years. Worked in various childcare sectors including holiday camps, nurseries, nannying, and babysitting. I only provide full days only. I can also offer Adhoc care and holiday only with flexibility minimum 3 hrs. Below are the latest reviews for Homefrom. Please note that reviews represent the subjective opinions of other Childcare.co.uk users and not of Childcare.co.uk. Parents must carry out their own checks and references on childcare providers to ensure that they are completely happy before enaging in the use of their services. Tor has been providing childcare for our little girl from the time she was about 18 months to 3 years old. Our daughter adores Tor and we have come to depend on her. Tor is flexible, thoughtful, diligent and, most importantly, provides a fun, stimulating and safe environment for our daughter. I cannot recommend Tor highly enough. Tor has been wonderful with our one year old son and her home setting is lovely, especially with the little garden. She’s extremely kind, very perceptive of what makes him tick and always keeps him busy! She has offered us the flexibility we have needed and given us confidence in putting him into childcare for which I’m very grateful. I would have no hesitation in recommending! Tor looked after my boys aged 5 and 7 for a day for us. They had a splendid time doing crafts, playing trains and taking an outing to the local park. They enjoyed the lunch she provided and have spoken about their time with her at length. My younger has made the flour glue Tor taught him, everyday since. She was professional and inspired confidence right from initial contact . We are an expat family only back in London from time to time but I would not hesitate to use Tor again. Thank you for your response. Your Boys are great, with amazing personalities and imaginations. It was a pleasure to spend time with them and I hope to see them again soon. Tor looked after my son whilst I had an interview in London. He really enjoyed his time with her. She was very attentive helping him settle- with an amazing collection of trains inside, then a sandpit and lovely garden outside. On the train on the way home he talked about everything he had been doing. Tor gave me an update on how he was getting on, which was very reassuring. Tor communicated very well with me prior to the visit, which reduced my worries prior to my interview. 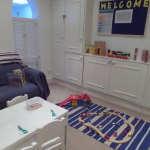 Her house is lovely, a very homely, child-friendly space. The lunch looked really nice too- and my little boy ate really well. Thank you for your review. It is always great to get such positive feedback and if you are in London again soon please get in touch. Tor is a well qualified childminder and has been fantastic when looking after my two boys. They are always excited to see her and she has a very warm and loving approach to looking after them, which is reassuring when leaving them. Tors house is well resourced with lots of interesting and fun activities to do, she is very well organised and cooks delicious and nutritious meals. My two can be boisterous and have a lot of energy, Tor is great at getting the balance right with outdoor and indoor play. I could not recommend her highly enough, we have been delighted with her and I know the boys are very fond of her too.